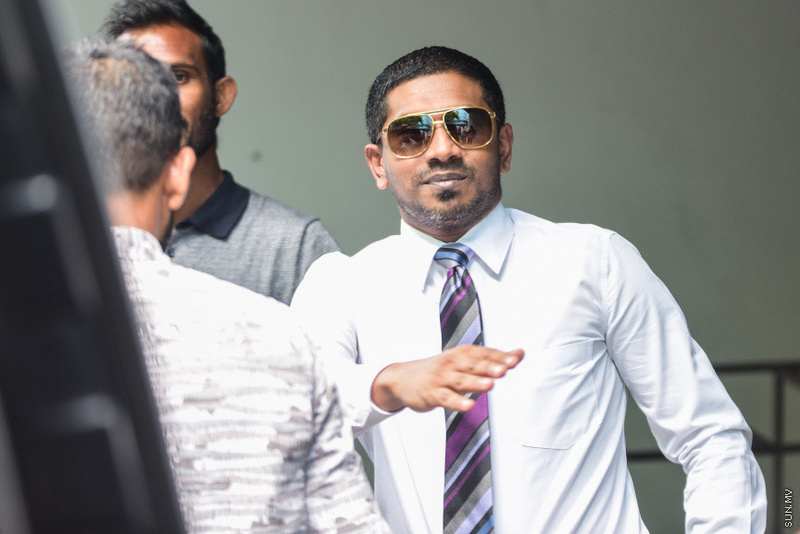 Hearings in the case against South Galolhu MP Ahmed Mahloof – who is accused of providing false information to a law enforcement agency – has now been concluded, and the MP now awaits the court’s verdict. The State prosecution and the defense presented their closing statements at the hearing held at Criminal Court this Wednesday. As soon as the hearing began, Mahloof stood up and asked for the hearing to be postponed, citing that his father is admitted at the hospital to undergo a major surgery. Presiding Judge Ali Adam asked Mahloof why the reason should necessitate a postponement in the hearing, and Mahloof answered that he had been informed he would be sentenced during the hearing. He said he feared he may not be able to see his family if he is sentenced. Judge Ali Adam said Mahloof was informed during the last hearing that Wednesday’s hearing is to hear closing statements. He advised Mahloof to pay attention to instructions by the court, rather than any outside gossip. Presenting the State’s closing statement, Prosecutor Shukurulla Shukoor said the tweet by Mahloof stating inmates were being killed in detention is false, and that a letter by Maldives Correctional Service proves no such incident took place. Mahloof had sent a letter to Maldives Correctional Service asking if the authority received any complaints regarding his tweet. And Maldives Correctional Service had replied that the authority received no complaints regarding his tweet. Mahloof had taken the letter as evidence to plead his innocence. However, during the closing statement, the State said Mahloof wasn’t charged based on any complaint. The State also contested Mahloof’s stand that Maldives Correctional Service is not a law enforcement agency. Mahloof’s attorney, Nazim Sattar has been suspended and Mahloof presented the defense’s closing statement himself. Presenting the closing statement, Mahloof said he wasn’t an attorney, and said he had prepared the closing statement in point form. The MP said he hadn’t made the tweet with the intention to inform people, but with the intention to voice his concerns. He said tweeting wasn’t a crime, as far as he had been aware. He said that the Human Rights Commission of Maldives was investigating deaths of several inmates. And that issuing a verdict against him before HRCM completes its investigations would cause him irrevocable damage. He asked that sentencing he stalled until HRCM completes its investigations. If found guilty, Mahloof could be sentenced to four months and 24 days in prison. The MP has already served 10 months and 24 days in prison after being found guilty of two charges of obstruction of a law enforcement officer.